"Scientism" is the position that Science can solve all problems, or that all problems are empirical. Philosophically, it is mostly associated with the strongest statements made by the logical positivism movement, which mostly died out in the mid 20th century. Culturally, however, it is stronger than ever, and is closely tied to movements like the so-called "New Atheists". These newer, more naive forms of Scientism, also have a strong tendency to call philosophy "a big waste of time", "pointless arguing", "nothing but semantics", etc. Rhetorically, they tend to say that non-empirical ideas have no way to guarantee they are true, so are pointless to talk about. This is a rather ridiculous point to make, since their entire movement is based around spreading a certain set of non-empirical, philosophical norms, which they apparently don't feel it necessary to open up to criticism. What they mostly seem to mean is, assuming everyone agrees with us on the important philosophic questions, such as atheism, utilitarianism, capitalism, eliminative materialism, etc., then we don't need anything but science. Well, this is maybe true in a strange way, insofar that if everyone agreed on every philosophical position, i.e. 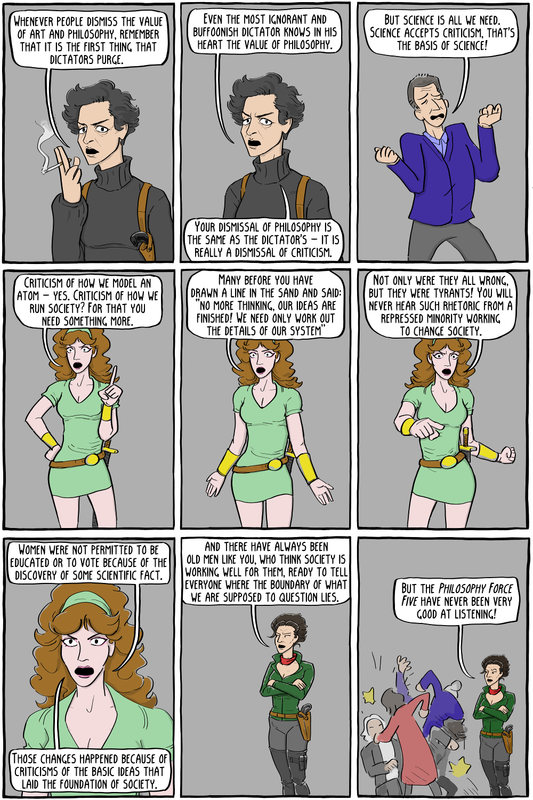 if philosophy was solved, then we probably wouldn't need philosophy. Philosophy, however, has not been solved. Furthermore, if it is going to be solved, it certainly won't be solved by a bunch of people who don't even read or engage in philosophy. The real goal is often just to draw a border around what we should or shouldn't question, because they don't want any of the fundamental aspects of society to change. And, well, people who don't want society to change often also find themselves not wanting people to even think about changing society. There's something about that critical posture that is to some degree intrinsically male and more attractive to guys than to women. The atheist variable just has this- it doesn't obviously have this nurturing, coherence-building extra estrogen vibe that you would want by default if you wanted to attract as many women as men. The "critical posture", of course, means "people who agree with Sam Harris". Someone who doesn't find it necessary to read a book about a topic before writing a book on that topic can hardly be said to have a "critical posture". You can see Christopher Hitchens talk about feminism here. Neil deGrasse Tyson is mostly being made fun of for saying that philosophy of science hasn't contributed to science. A rather odd statement, since anything that contributes to science would just be science. 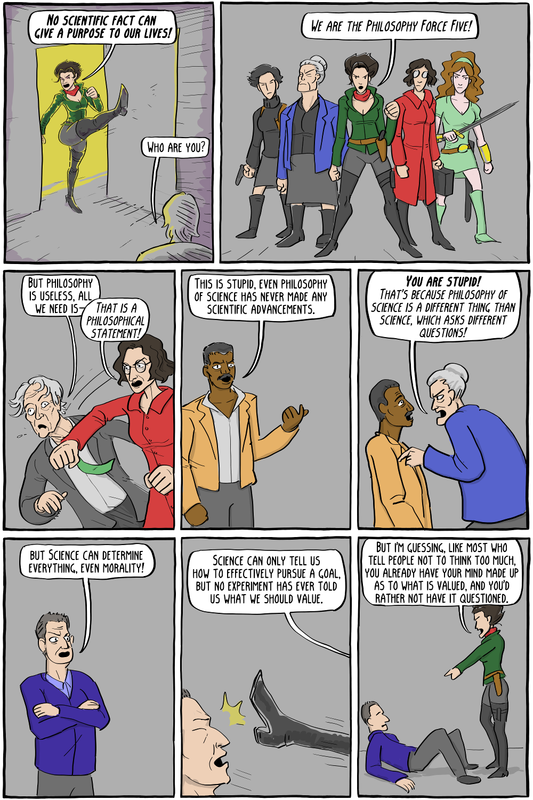 Philosophy of science asks different questions, like what science is and why and how it works. He probably shouldn't be lumped in with the others politically, and he isn't as anti-philosophy as a whole, as far as I can tell. Please send your hatemail to idontgiveashit@existentialcomics.com. 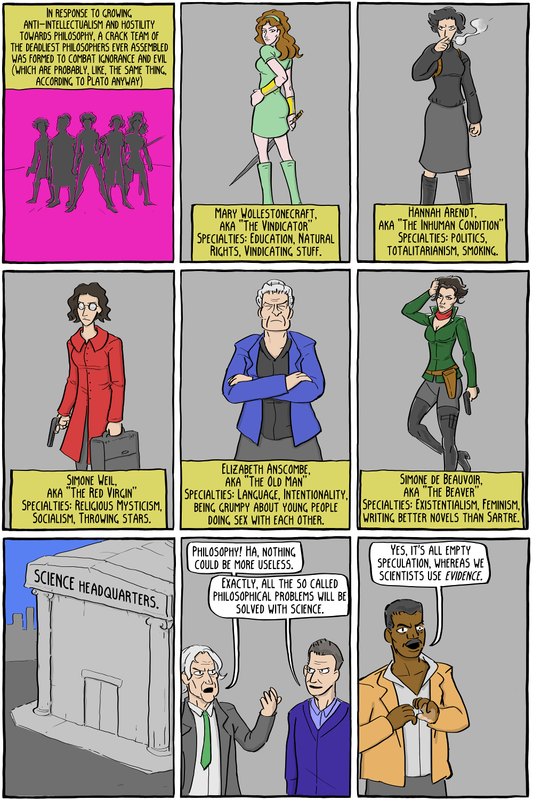 "Philosophy Force Five" is a parody of "Fox Force Five", the failed pilot TV show that Uma Thurman's character was in from Pulp Fiction, on which the deadly female assassins of Kill Bill are also somewhat based.